While the Victorian electricity market has been deregulated since 2002, the number of different distributors and retailers, along with the popularity of dual-fuel bundles, makes it one of the most complicated states to accurately compare energy plans and companies. The retail electricity market in Victoria is heavily scrutinised by the government-run AER in order to maintain fair prices for consumers. While the average household in Victoria uses less electricity than homes in other states, the average retail margin on electricity is the highest in Australia. Electricity prices in Victoria have gone up due to increases in network costs, the closure of the Hazelwood power station, and cost recovery of new metering infrastructure. Overall, there’s been a lot of change in the types of plans and prices offered by Victorian electricity retailers. Households and businesses within each of these distribution regions will have a different tariff and a different rate structure depending on the type of meter. A large number of different retailers operate within each distribution area. 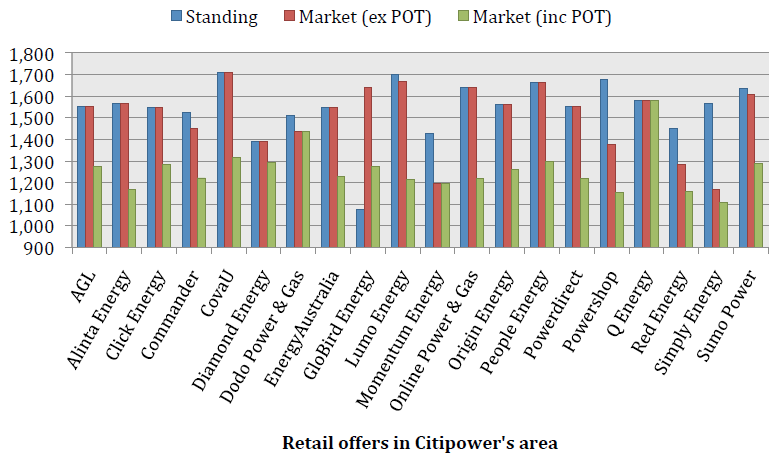 Each of these retailers has their own plans with different rates for peak, shoulder, or off-peak usage as well as various discounts and other pricing arrangements. It helps to start with the basics so you can understand the differences between the rates and plans offered by each supplier. Let’s start by looking at your bill, so you can understand the difference in what each supplier is likely to charge you for. Your electricity bill is made up of two main costs – the usage charge and the supply charge. These rates can vary dramatically depending on where you live. Homes and business whose electricity is supplied on the AusNet or Powercor networks will often get a cheaper rate than those in rural Victoria using Jemena or United Energy. This is due to the increased costs of supplying electricity to rural areas. The supply charge is the fee you pay to be connected to the grid. This fee will normally stay around the same every bill (unless your supplier changes their pricing). This “service to property” fee is charged in cents per day. Keep in mind too that if you see a plan that has a surprisingly low supply charge, this will generally be offset by a higher usage fee. The usage charge is a fee your retailer charges you for the amount of electricity you use. It is charged in cents per kilowatt hour (you many see it abbreviated on your bill as c/kWh). Your electricity usage rate will vary according to the type of tariff you are on, but is generally made up of peak and off-peak usage charges. Your tariff should be shown on your bill. If not, give your supplier a call to find out the type of tariff you’re on. Once you know this, you’ll be able to compare other rates and plans to see if you’re able to save money. In addition to the usual Time of Use and Single Rate tariffs, the introduction of new electricity retailers to the market has seen new plan structures with different types of tariffs. What are Time of Use Tariffs? A time of use tariff means you’ll get charged different rates depending on the time of day you use you electricity. This usually means higher rates during peak times (the afternoon and evening), slightly lower rates during the shoulder period (early morning), and then lower rates during off-peak times (generally overnight). A similar tariff offered by some companies is the Flexible Pricing Tariff. What is a Single Rate Tariff? A single rate tariff means you’ll have one set rate for your usage, no matter the time of day or night you’re using your electricity. These are generally higher than other tariffs and are less common with the introduction of smart meters. What is a Controlled Load Tariff? Controlled load tariffs apply to single appliances that generally have their own electricity meter. Things like electric hot water systems, underfloor heating, and your pool pump are likely to be on a controlled load tariff. If controlled load tariffs are available, they will often be significantly lower than other usage rates as long as you use them outside of peak hours. You can have more than one appliance on its own controlled load tariff. What are Block Rate Tariffs? Some companies will offer electricity in ‘blocks’ of a certain amount of kilowatt hours per day or per billing cycle. For example, you may be charge one rate for your first 1,000kWh each quarter, and a different rate for subsequent blocks. What is a GreenPower Tariff? Many electricity retailers now offer Green Energy plans that allow consumers to choose carbon offsets or renewable energy generators. These plans typically allow users to choose to have between 10% to 100% of their supplied energy generated from renewable energy sources like wind, hydro, or solar. Customers generally pay a few cents extra per kWh depending on the amount of sustainable energy they want to use. What are Feed-in Tariffs? These rates only apply to customers with solar panels. When the panels are generating surplus electricity it gets supplied back to the grid so everyone else can use it. Owners might receive a small credit on their bill for each kWh of electricity their solar system delivers back to the electricity grid. Knowing what type of plan you’re on will help you work out if it’s the right plan for you. Understanding the range of plans on offer from the different companies will help you decide if you should switch companies or change plans for a better deal. The main types of energy plans available are: fixed rate plans and variable rate plans. What is a Fixed Rate Plan? A plan with a fixed rate will not change over the length of your contract. This means you’ll always be charged at the same usage rate with only the amount of electricity you use determining your quarterly power bill. This can mean big savings if you’re prepared to sign up for a 1 year or 2 year contract. Not all companies offer fixed rate plans, and not all consumers are happy to be locked into a long-term contract. What is a Variable Rate Plan? 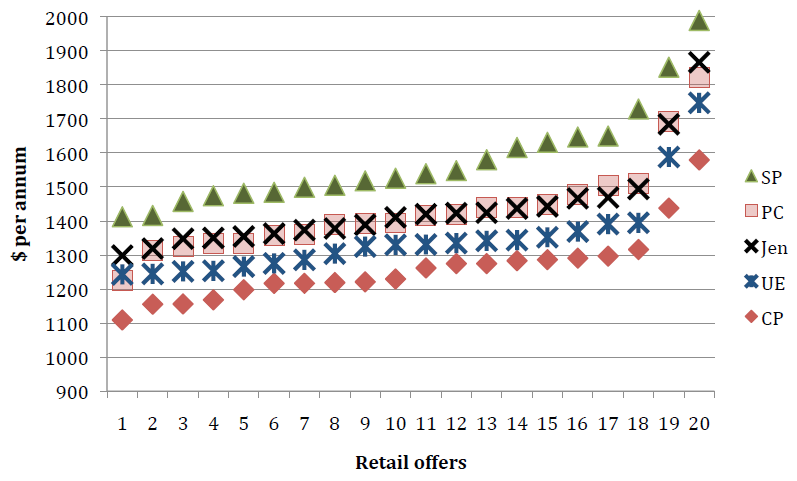 Most retail market plans come with a variable rate. This means the rate your retailer charges you for the electricity you use can vary according to wholesale energy prices and even at your suppliers’ discretion. These are the usual types of plans you’ll find, so these are where you can see the most savings, when shopping around. Exit fees can apply to both fixed rate and variable rate plans. All electricity companies will offer a standard, non-discounted plan, with many also offering a range of more competitive market offers which may appeal to different customers for different reasons. What is a Standing Offer? The default pricing structure published by energy retailers is usually their highest priced plan. If you were automatically allocated to an electricity company when Victoria was deregulated, you would have been placed on a standing offer. Default Standing Offers vary greatly across the different electricity networks and between electricity companies. Most people in Victoria have switched from the default standing offer and chosen their own supplier, however 9% of customers have not taken the time to switch to a better market deal. These customers would be paying the highest rates and are likely to be wasting hundreds of dollars every year. The 2017 Tariff Tracking project found that a typical duel-fuel household in Victoria using an average of 4,800kWh of electricity per annum would save between $590 to $830 a year (depending on their network area) if they switched from the default retailer’s standing offer to the best market offer. For example, for households in Melbourne on the Citipower network, there is a difference of around $590 between Standing Offers, Market Rates, and Market Rates with extra discounts for paying on time. What is a Market Rate? Because of increased competition in the electricity industry, market offers have the potential to deliver huge savings. These rates tend to offer a range of discounts depending on payment methods, paying on time, bundled energy, or a range of other options. Different electricity companies will offer a range of pricing structures and plans to attract customers depending on their needs and usage. While there is a great deal of variation in yearly electricity bills depending on which company you choose, it’s important to choose an electricity retailer whose plans offer the features you need. 1. How much can you increase my rates each year in this contract? Do I have any rate protection? Most companies will say it is pegged to CPI, or there is no cap. Ideally you want to find a company who offers a maximum rate increase guarantee. If you prefer a fixed-rate plan, you need to compare only those offers rather than advertised deals. 2. What will you charge me if I move homes? Do I have to use the same provider in my new home? Make sure you won’t be getting slugged any fees when moving—it’s already a stressful experience enough on its own. Some companies may have an exit fee or a new connection fee. 3. Will you give me a discount off the total bill or just the usage rates? This one is important to know, as there’s quite a difference in price with a discount off your rates, as opposed to a discount off your total bill. 4. Will you match or beat another company’s offer? Shop around, find a rate you like, then ask your supplier of choice if they’ll match it. You’ll be able to get a better rate, save money, and go with the supplier that suits you. There is an easier way to get an electricity comparison in Melbourne or Victoria. Call Electricity Wizard on 1300 359 779 and we’ll compare your current plan against leading electricity suppliers to find you the best deal. Electricity Wizard offers a personalised service. We speak with you to find out what you need, we answer all your questions, and give you an electricity plan comparison in one short call. Call 1300 359 779 and let us help you make the right choice.